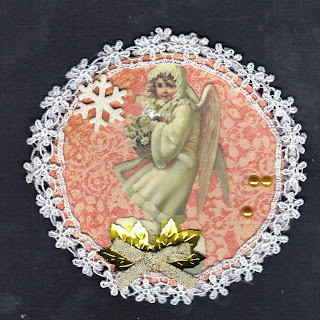 "Here is an ornament using a snow angel. The base is a coaster covered with cardstock with a Lunagirl image in the middle. This piece is fairly fragile as the lace was hard to place around the edge on both sides. Embellishments include a snowflake, a bow, gold leaves and half pearls." GORGEOUS ornament Vicki! Love it! !